If I haven't said it before then I probably should say that Toriyama's drawing style will always be the way I think anime and manga should be drawn. He is my hero. However, it wasn't until I started reading manga that I really grew to respect him beyond the fight scenes and badass superpowers of the anime. Toriyama is hilarious when it comes to toilet humor and nothing showcases that better than his manga. 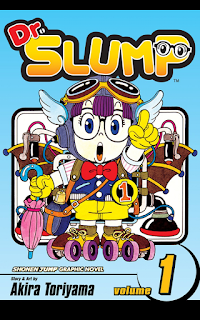 In 1980 when he set out to create Dr. Slump I'm fairly certain he didn't have anything close to a set plot. He just sat down and drew some stuff. A robot girl being created by a scientist seemed as good a place as any to start, I imagine. Everything you loved about the Dragonball series came from Dr. Slump. Kame-sen'nin would have been great friends with Norimaki Senbei and I suppose it is no surprise that Toriyama brought back the Dr. Slump gang for an encore in an early Dragonball volume. The eyes bulging when something crazy happens, the perverted jokes, and the always funny gag of people falling flat on their faces when someone else does or says something stupid. It's all here. Not too mention the robots, mad scientists, boobies, talking animals, etc. It's all in this first volume that broke Toriyama into the manga world. I highly doubt a lot of folks know of Toriyama in the Western world outside of his contributions to Dragonball and Dragonball Z. I'm not sure I've even met one other person that has actually tried their hand at the manga, but then I live in Alabama so I'm not surprised. We ain't the most literate bunch 'round these parts. Of course, there are plenty of people that know Dragonball from the manga in the West, but I imagine that Dr. Slump has a much smaller Western audience. 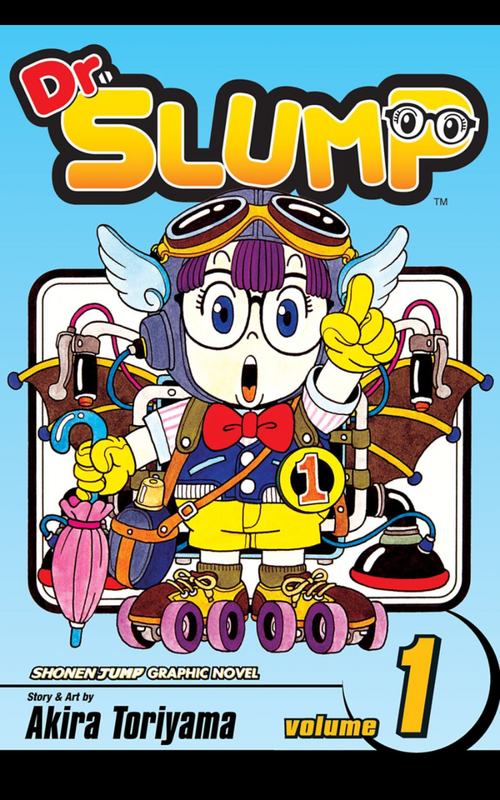 However, I can tell you that Dr. Slump is much funnier than its more popular predecessor. Much funnier. I've read where Viz actually edited a lot of the humor because they considered it too risque, but in Japan this stuff is elementary school humor. The volume labels this as "T for Teen" even with the edits, but Amazon itself describes this as being for "5 and Up." Go figure. I'm a bit bummed about the edits, but I'll take what I can get at this point. This volume is still hilarious and the part about Senbei trying to see a naked woman for the first time by using special glasses had me dying. I'd love for the anime series to be brought into the US, but I suppose there's fat chance of that. The anime was made from 1981-1986 and if it hasn't been made available to the US yet it probably won't. Still, I'm going to hold out hope that Dragonball fanboys everywhere will ignite the flame of passion for this lesser known manga, too. It's not too late. We've already got an English adaptation of the manga to just about everyone's surprise. Let's get that anime, too. But, going back to this volume, if you don't laugh from this you just aren't human. I'll go into more details when I dish out the goods on the second volume, but I'm hoping this will be more of a teaser than anything else for unknowing manga aficionados. Give this a shot. It's funny. It has absolutely nothing close to a coherent plot, but this series lasted for five years and there is a reason it did. This is the proof that Toriyama's abilities did not begin with Dragonball. It was all there from the beginning of Dr. Slump.